In a major shift, historically conservative Japanese institutions are significantly increasing their investments in hedge funds, private equity, private debt, infrastructure, and other unlisted asset classes. The average Japanese corporate pension fund now has a 17 percent allocation to alternative investments, up from 11 percent in 2013, according to J.P. Morgan Asset Management’s annual survey. Furthermore, six in ten pension funds said they plan to increase their alternative investments next year. The asset manager interviewed staff members at 120 corporate defined benefit pensions between March and mid-June 2018 for its 11th annual survey. The study covers fiscal years 2016 and 2017 as well as allocators’ plans for the future. Domestic bond allocations fell to 21.7 percent on average, the lowest level since JPMAM began been tracking the market. The move out of bonds coincides with the Bank of Japan’s policy of keeping interest rates negative to spur economic growth. The policy has hurt its institutional investors who tended to invest heavily in sovereign bonds. To offset disappearing bond yield, pension investors are hoping alternatives such as infrastructure and real estate can help them meet their return targets. “Japanese corporate defined benefit pension plans remain under pressure to generate returns sufficient to fund their obligations and are gradually unshackling themselves from a long tradition of highly conservative investing,” institutional sales head Yoichiro Nitta said in a statement. “The challenge will continue as anticipated bond and equity returns remain subdued, the Bank of Japan sticks with ultra-loose monetary policy to coax inflation, the U.S. economy is late cycle, and Japan’s GDP forecast is unclear,” he continued. JPMAM also found that Japanese institutional investors are using absolute return/unconstrained fixed income, multi-asset strategies, and private debt funds to help manage volatility. Twenty percent of Japanese institutions have nixed domestic bond and equity buckets and instead now use global versions of each as they continue to diversify outside their home market of Japan. “Within these newly condensed buckets, exposure to domestic assets is generally falling at the expense of greater allocation to foreign assets,” the announcement said. Although Japanese pensions are moving further into alternatives, many of them still have concerns. 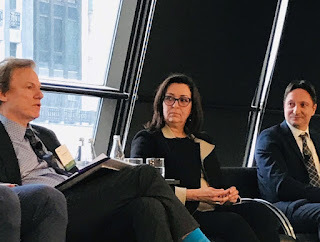 Common hurdles include communicating how the investments work to boards and other stakeholders; whether low liquidity assets have been flooded with capital and are in a bubble; and understanding where risk lies. “Defined benefit pension fund managers are racking their brains to explain complicated instruments and upgrade their portfolio management,” the JPMAM report stated. Appetite among Japanese pension funds for alternative investments has hit a new peak at the same time as bond allocations have sunk to a record low, according to a survey by JPMorgan Asset Management. 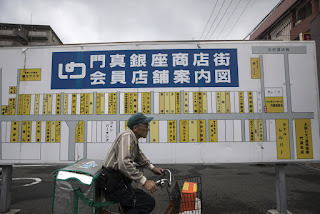 Pension funds in Japan, historically regarded as some of the world’s most conservative investors, have been forced to make radical changes to boost returns as a result of the extreme measures taken by the Japanese government to stimulate economic growth and inflation. JPMorgan surveyed 123 Japanese corporate pension funds and found that the average allocation to alternative investments reached a record 17.1 per cent in March, up from 11.4 per cent over the past five years. Exposure to Japanese government bonds dropped to 21.7 per cent, the lowest in the 11-year history of JPMorgan’s survey. Japanese policymakers have deliberately held interest rates at ultra-low levels since 1999 in an effort to boost economic activity. The benchmark 10-year government bond yields just 2 basis points. Expected returns among corporate pension funds have fallen over the past decade from about 3.5 to 2.6 per cent, reflecting the downward pressure on domestic interest rates. “Japanese corporate pension funds remain under significant pressure to generate sufficient returns to fund their obligations and are gradually unshackling themselves from their long tradition of highly conservative investing. Alternatives have now truly become a mainstream asset class for Japanese pension funds,” said Akira Kunikyo, an investment specialist in JPMorgan AM’s Japan institutional business. Katsunori Kitakura, lead strategist at SuMi Trust, the $475bn Tokyo-based asset manager, said that difficulties in forecasting the future performance of alternative investments raised concerns over whether these illiquid assets would deliver the returns required. JPMorgan’s survey showed that just under 60 per cent of corporate pension funds intended to raise their exposure to alternatives over the next year. 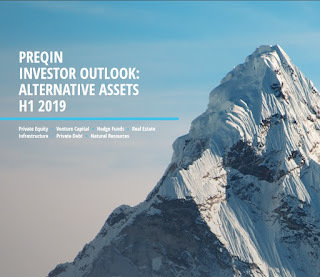 “We expect to see investors continue to ‘push the envelope’ on alternatives to boost returns and increase portfolio resilience,” said Mr Kunikyo. In April 2017, Japan’s Government Pension Investment Fund invited proposals from alternative investment managers to handle private equity, infrastructure and real estate allocations via funds of funds. The number and size of new mandates has not been disclosed by the GPIF, which holds a fraction of its assets in alternatives. Japan’s Government Pension Investment Fund returned 6.9 percent, or 10.1 trillion yen ($91 billion), in the year ended March 31, with assets totaling 156.4 trillion yen, it said in Tokyo on Friday. Domestic stocks were the fund’s best-performing investment, adding 5.5 trillion yen, followed by a 3.5 trillion yen increase in overseas shares. Domestic bonds gained 362 billion yen, while overseas debt rose 674 billion yen. Six quarters of gains boosted assets to a record at the end of 2017. 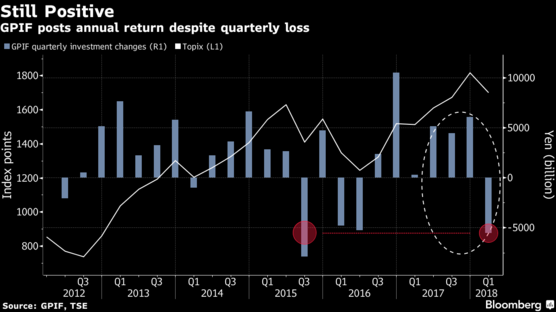 The GPIF incurred losses during the first three months of this year as investor sentiment turned from optimism over U.S. tax cuts to fears of a trade war. 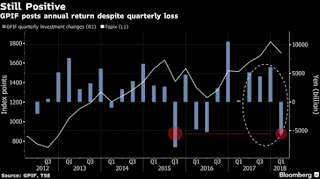 A global equity rout and plunge in Treasuries in its final fiscal quarter kept the fund from beating a record 12 percent annual gain set three years ago. Trade friction between the U.S. and China has become a big issue when assessing the investment environment, Takahashi said at a press conference in Tokyo. In addition, he said the fund is cautious about investing in Japanese bonds with a maturity less than 10 years because of negative yields. Did you catch that last part? When people ask me about the US bond market, I tell them to forget articles in the Wall Street Journal claiming US corporations are behind the rally in Treasurys and look at what is happening overseas where there is a record amount of sovereign debt trading at negative yields. So it's not surprising that Japanese pensions, insurance companies and other foreign investors stuck with the same dilemma are going to look for yield in the US bond market, investing in corporate bonds and US Treasurys. Why don't they only invest in US bonds? Because their liabilities are in local currency (like yen in this case) and there are F/X hedging costs involved which come back to bite them when the US dollar underperforms like it did last year before reversing course this year. All this to say, even with negative yields, global pensions will still invest in their own bond market when it makes sense. The obvious problem is that negative yields don't pay pension benefits. These Japanese pensions need to generate returns to match assets with their long-dated liabilities. And negative rates means these liabilities have mushroomed since the financial crisis but their asset allocation is still way too conservative so they are not able to generate the required rate of return. It's pretty much the same problem every pension has all over the world. Historic low rates are forcing everyone to take more risk in risk assets like stocks and corporate bonds but these risk assets are very volatile, so here comes JPMorgan recommending everyone shifts more assets out of bonds and into alternatives. Great for JPMorgan, they can recommend alternatives to all their clients all over the world and generate huge advisory, underwriting and trading fees but is it the best course of action for pensions and their members over the long run? I just finished a comment going over Pennsylvania's pension fury where I discussed why simply shifting assets into alternatives without a plan and strategy is a recipe for disaster. The big squeeze is a real issue for many underfunded US pensions which have been paying hundreds of millions in fees to alternative investment managers and receiving mediocre returns over the long run. But the problem isn't fees. The problem is governance and no strategy when it comes to alternatives. Today, I had lunch with a representative from Partners Group, a global powerhouse in private market investments. This fellow was super nice and very sharp. He invited me to lunch after reading my comment on PSP ramping up its direct investments. Anyway, we talked about the Caisse going direct in private equity and PSP upping the dosage too and we noted that Stephane Etroy (Caisse) and Simon Marc (PSP) are doing a great job executing their strategy in private equity, ramping up co-investments to scale into the asset class and lower overall fees. He told me that they view both these gentlemen and their team members as highly sophisticated investors "who bring a lot more than capital to the table". "It's the same with folks from AIMCo, CPPIB, OMERS, and OTPP." He told me that Partners Group is focusing more on bespoke investing and there is a gamut between fund investments and co-investments. 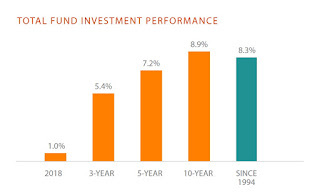 They are also focusing more on long-term investing keeping some portfolio companies much longer than the typical 3 to 5 years. He also told me that in the US, their best-performing LP is one that doesn't press them on fee conscessions but one that is able to quickly evaluate opportunities as they arise and partner up with them on deals. He even gave me the example of a recent deal where the LP's employees were on vacation but over the weekend, they managed to go to their board and come back quickly on a co-investment deal. That is unheard of. A process like that takes great governance, a great team to evaluate co-investments quickly, and a quick turnaround. That's not something you'll find at US public pensions which are often weighed down by politics. There are good people working at US public pensions but the process is highly bureaucratic and the governance is weakened by political interference. Why am I bringing this up here? What does this have to do with Japanese pensions? Because Japan's GPIF has a giant beta problem, just like Norway's monster pension fund which has gained very nicely since March 2009 when global stocks bottomed and rallied hard ever since. But what happens when beta works against these funds like in a long, protracted bear market? 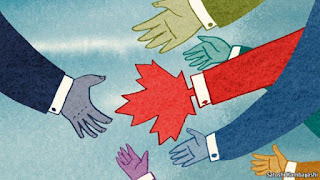 Unlike Canada's large pensions which are well diversified across global public and private markets and have executed their strategy nicely focusing on hiring top talent to lower fees by doing more co-investments, many global pensions are very vulnerable if another downturn strikes. But blindly shifting ever more assets into alternatives at this stage of the cycle is a recipe for disaster. You need a strategy, long-term focus and discipline or else forget alternatives, it's not worth it. Japan’s Government Pension Investment Fund (GPIF) has recorded a return of 5.25% (in US dollars) on its ¥196.8bn (€1.51bn) core infrastructure portfolio in the 12 months ending 31 March 2018. It is the first time that the ¥156.4trn pension fund has disclosed details about its alternative investments in its annual investment report. According to the report, the infrastructure portfolio includes investments in the Port of Melbourne in Australia, and Birmingham Airport, Bristol Airport and Thames Water in the UK. GPIF said its infrastructure investments were located mostly in the UK (57%), Australia and Sweden (both 15%), Spain (10%) and Finland (3%). The pension fund first invested in infrastructure in 2014 when it become a co-investor in the Global Strategic Investment Alliance (GSIA) with Canadian pension fund OMERS and the Development Bank of Japan (DBJ). It also invests globally in infrastructure funds through multi-managers DBJ Asset Management, StepStone Infrastructure & Real Assets and Pantheon. GPIF’s real estate exposure is smaller at ¥8.1bn, according to the report. The pension fund plans to increase this through domestic and global multi-manager mandates. Late last year it appointed Mitsubishi UFJ Trust as its domestic real estate multi-manager, and has yet to announce its global real estate multi-manager. GPIF’s plans to invest in core real estate to generate long-term, stable income. Norihiro Takahashi, GPIF’s president, said the pension fund’s overall portfolio returned 6.9% for the fiscal year. He attributed the performance to a strong global economy, which had buoyed global stock markets, but warned of uncertainties now created by trade tensions between the world’s largest trading nations. On private equity, GPIF's CIO rightly notes it's fast becoming more mainstream but if I were to consult GPIF and Japan's corporate pensions, I'd tell them to contact Partners Group, Blackstone, KKR, TPG and a list of top funds but also talk to guys like Mark Wiseman and André Bourbonnais who are now working at BlackRock. You need to get the right team in place for alternatives especially when you're the size of a GPIF or some of these monster Japanese corporate pensions but more importantly, you need to get the strategy right or else you will regret getting into alternatives. Many US public pensions didn't get the strategy right and now they're coming to the realization that more alternative investments haven't helped in terms of their long-term performance and improving their funded status. It's been a boon for alternative investment managers but not so much for public pensions and their members. All this to say, Japanese and other global pensions looking to embrace alternatives need to first and foremost get the strategy right and develop a long-term plan to slowly but surely build out co-investments to scale into private equity and lower overall fees. Using funds of funds is fine initially but that's not a long-term strategy. Fund investments and co-investments is the long-term strategy which has led to the success of Canada's large public pensions but before you get the strategy right, you need to get the governance right and I'm not sure that's easy in Japan or elsewhere. So when I read articles like the one above on Japan's pensions embracing alternatives, I'm very cautious. This is great news for JPMorgan, Goldman, and their top-paying clients which are top alternative investment managers, but it remains to be seen as to how this will help Japanese pensions over the long run. I'm also very concerned as to what all this money chasing alternative investments globally will do to dilute returns in the long run. What did Tom Barrack once say about "too much money with too few brains chasing too few deals"? Below, an interview with Hiromichi Mizuno, GPIF's CIO. 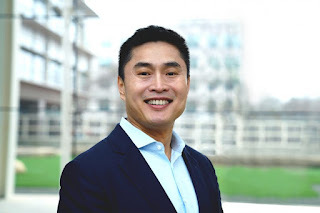 You can also read this recent SWFI interview with 'Hiro' who rightly introduced performance fees for active managers back in April. And Alvin Liew of UOB says a change in consumer "mindset" is likely required for Japan's inflation outlook to improve. Unfortunately, I see no such change on the horizon and fear Japan's deflation demon is spreading throughout the world, ensuring historic low rates are here to stay.